This FourSeasonsDream baby cot set is handmade in cottage-craft style. With its seven soft, padded figures, the set provides a pleasantly soft pillow bumper for the baby cot. The collection, which features designs for every season, also includes a canopy and canopy holder. 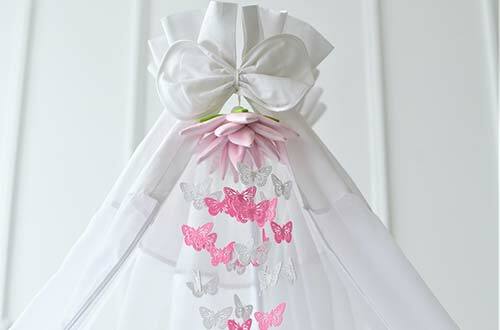 The canopy, made of sheer voile fabric, protects your baby from drafts. This set will be a real eyecatcher for your baby, and one that stimulates curiosity too.